Pittsford Mendon’s Michael Harrington (15) and Jacob Shadders (1) look to trap Rush-Henrietta’s Javonte Williams (15) during the recent RAP Invitational played at East High. At 15-0, Mendon remains as one of two undefeated teams in Section V.
ROCHESTER, N.Y. – The Pittsford Mendon Vikings continued their undefeated run and took Team of the Week honors for the second time this season. Mendon won all three of its games last week by 22 or more points. Monday night, the Pittsford Mendon Vikings (15-0/No. 3 NYSSWA/No. 1 PS LS Poll) defended home court with a 90-68 victory against Utica-Proctor. Senior forward Daniel Cook netted 22 points and hauled in 20 rebounds. The Vikings then proceeded to win back-to-back games in less than 24 hours. Friday night, Bob Nally’s squad traveled to Brighton High School. There, the Vikings took down the Brighton Barons, 85-50. Senior guard Michael Harrington scored all 18 of his points in the first three quarters, knocked down four shots from beyond the arc and grabbed eight rebounds. Cook recorded a double-double of 12 points and 10 rebounds. Saturday afternoon, the Vikings hosted Leadership Academy, who had won three of its last four games. Nally’s squad pulled away for a 90-65 win. Cook poured in 27 points and collected 15 rebounds to lead the Vikings. The senior forward now has 14 double-doubles this season. Harrington netted 19 of his 21 points in the first half. Sophomore guard Jacob Shadders had a double-double of 13 points and 10 assists. The Vikings have now won 11 games by 20 or more points, including five of their last six. In those games, Nally’s squad is averaging 89 points, allowing 53.9, and have outscored their opponents by 386 points combined. This upcoming week, the Vikings have another three games. Monday night, Nally’s squad will host Wilson Magnet at 6:30 PM. Wednesday night, the Vikings will head to Fairport to take on the Red Raiders at 7:30 PM. To finish the week, Greece Athena will travel to Pittsford Mendon High School Friday night looking to avenge a 65-61 loss on December 5. Game set to tip off at 7:15 PM. Fairport (No. 9 PS LS Poll) defended home court on its Senior Night ,Friday, with a 90-50 victory over Victor and took down McQuaid (No. 14 NYSSWA Class AA/No. 5 PS LS Poll) on the road Saturday, 74-61. The Fairport Red raiders have won three straight games. Greece Athena (No. 13 NYSSWA Class A/No. 5 PS LS Poll) won both of its home games last week against Hilton (No. 7 PS LS Poll) Monday night, 59-49 and Greece Arcadia Friday, 73-34. The Trojans are on an eight-game winning streak. Pittsford Sutherland defeated Brockport at home Friday night, 67-54, and took down Churchville Chili on the road Saturday evening, 73-47. The Knights have won three of their last four games. 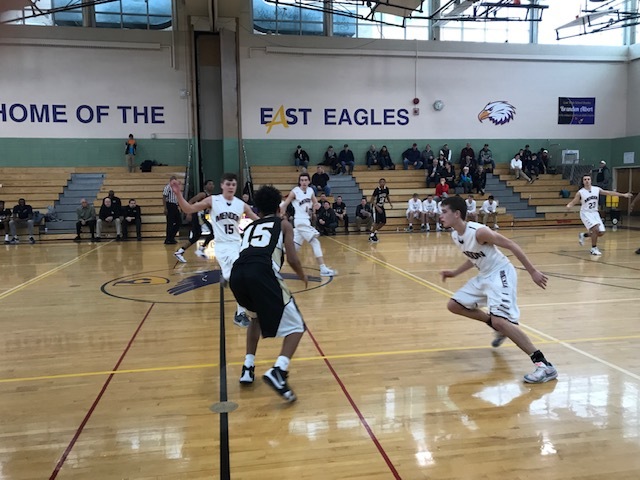 Greece Olympia stunned Eastridge in the closing seconds with a 65-63 road victory Friday night and defended home court against Rochester Prep Saturday afternoon with a 92-48 win. Charles G. Finney (No. 7 NYSSWA Class C/No. 7 PS SS Poll) took down Prattsburgh (No. 1 NYSSWA Class D) Tuesday night, 88-61, and Lima Christian Friday, 78-34. The Falcons have won four games in a row. 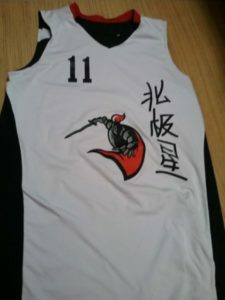 Northstar Christian will wear alternative uniforms when they play at Bishop Kearney on Chinese New Year (Tuesday, February 5th). (Photo provided. Tuesday, February 5th, is the Chinese New Year. Northstar Christian (16-0/No. 8 NYSSWA Class A/No. 3 PS LS Poll) will commemorate the holiday when the Knights take on Bishop Kearney. With Chinese International students David Chen and David Li on their roster, Northstar will don alternative uniforms for the night. Tip off Tuesday night is set for 7:45 PM at Bishop Kearney High School. Pittsford Mendon (15-0/No. 3 NYSSWA/No. 1 PS LS Poll) and Northstar Christian (16-0/No. 8 NYSSWA Class A/No. 3 PS LS Poll) are Section V’s remaining undefeated teams with 11 days left in the regular season. Mendon has to play three games again this week against Wilson Magnet, Fairport, and Greece Athena. The Fairport Red Raiders (No. 9 PS LS Poll) are coming off a win on the road against McQuaid (No. 14 NYSSWA Class AA/No. 5 PS LS Poll) and the Greece Athena Trojans (No. 13 NYSSWA Class A/No. 5 PS LS Poll) are looking to avenge one of their two losses, which was to the Pittsford Mendon Vikings. Northstar Christian has two road games this week against Bishop Kearney and Charles G. Finney (No. 7 NYSSWA Class C/No. 7 PS SS Poll). The Charles G. Finney Falcons will look to avenge a loss at Northstar Christian on January 11. Some notable active winning streaks: Marcus Whitman (12), Gates-Chili (8), Greece Athena (8), Wayne (7), School of the Arts (7), and Mount Morris (7). Hilton vs. Penfield – Hilton (No. 7 PS LS Poll) is scoring 71.6 points per game while Penfield allows 58.6. Game set to tip off Thursday night at 7:00 PM at Penfield High School. Pittsford Mendon vs. Fairport – Fairport (No. 9 PS LS Poll) is averaging 63 points per game and Pittsford Mendon (No. 3 NYSSWA/No. 1 PS LS Poll) gives up 52.9. Game set to tip off Wednesday night at 7:30 PM at Fairport High School. Batavia vs. Greece Odyssey – Greece Odyssey (No. 18 NYSSWA Class B/No. 2 PS SS Poll) scores 69.6 points per game while Batavia is allowing 54.5. Game set to tip off Friday night at 7:15 PM at Greece Odyssey High School.